Last year, according to foreign trade statistics from the Swiss Federal Customs Administration, Swiss companies exported goods in the amount of CHF 220 billion – a new record. Exports are high this year, too. Sascha Jucker, an economist at Credit Suisse, expects an overall increase in exports of 4.0% for 2018. For 2019, he expects a slightly weaker increase in exports of 3.5%. The solid growth can also be seen in the Credit Suisse export barometer. It reflects the foreign demand for Swiss products. 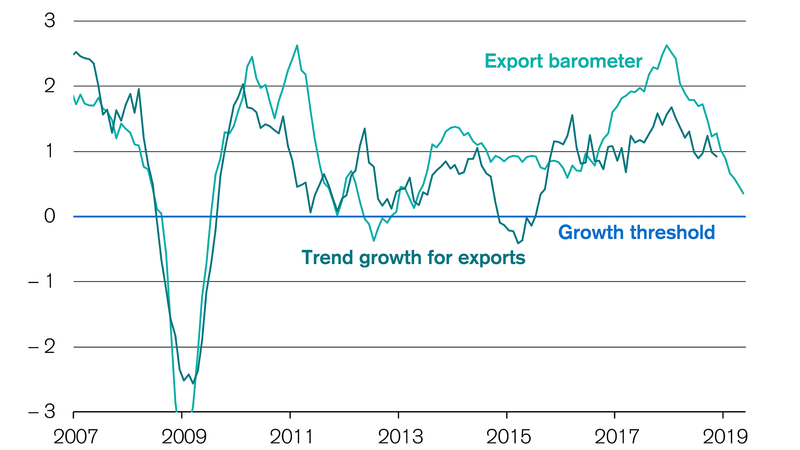 It is true that the export barometer sank slightly in the fourth quarter of 2018, but it still indicates growth. Credit Suisse therefore expects the demand for Swiss exports to grow in the future as well. However, these figures somewhat mask the fact that exporting is a challenge for companies. New technologies, increasing competition from emerging markets, and increasing protectionism are making it more difficult to expand into new markets. Daniel Küng, CEO of Switzerland Global Enterprise, advises companies not be put off by trade barriers. In the interview, he highlights Switzerland's strong position: "Countries with numerous Free Trade Agreements are in a comparatively strong position. Switzerland has a network of 30 bilateral trade agreements. That is a huge advantage." Still, it's important to be well informed. It's especially helpful to have checklists that can be worked through systematically. Credit Suisse has been an important partner of Switzerland Global Enterprise (S-GE) since 2009. This operator of a global expert network promotes exports and investments on behalf of the federal government (State Secretariat for Economic Affairs, SECO) and cantons, and helps clients achieve new potential for their international business, thereby strengthening Switzerland as an economic center. Thanks to this partnership, Credit Suisse corporate clients benefit from extensive specialist knowledge and a network of contacts in all major export markets. Germany is by far the most important country for Swiss exporters. In 2017, more than CHF 41 billion worth of goods were exported to our neighbor. The Swiss foreign trade statistics show this. The US is the second most important export market. Goods worth CHF 33.7 billion were exported there. It is interesting to see which export markets are enjoying particularly strong growth. Here too, compared to the previous year, Germany (increase of CHF 1.6 billion or 4 percent) and the US (increase of CHF 2.2 billion or 7 percent) are the most important markets. However, China is catching up. The Swiss export volume to China already amounts to CHF 11.4 billion. Compared to 2016, this is an increase of CHF 1.5 billion or 15.6 percent. For Swiss SMEs, however, there is a world of difference between exporting to Germany, the US, or China. Cultural characteristics, customs regulations, sales platforms, marketing tools, data protection, and laws are all very different. Paul Note, CEO of Geistlich Pharma, knows this well from personal experience. The company is a global leader in the regeneration of bones and gums. In order to meet local needs, Geistlich Pharma has founded ten subsidiaries. "We feel that direct contact to doctors and dentists is essential. This is most easily done using subsidiaries," said Paul Note. Sven Götti, founder of the eponymous eyewear label, follows another export strategy. Götti has a subsidiary only in the US. Elsewhere, he exports directly from Switzerland. In the EU, he exports through Germany. This isn't always easy. For example, three years ago, the new customs law in Germany created new challenges for Götti. Regardless of the strategy chosen, it is important to learn from the experiences of other companies and avoid typical mistakes when exporting. "It always strikes us how unprepared some companies are when they tackle a new country without first considering the local circumstances," said Stefan Gerig, Head of Export Finance at Credit Suisse. He advises companies regarding financial products and loans. Tapping into a new export country can, in some cases, be a long process that requires careful preparation.